Pinched Sciatic Nerve? Lower Back Pain? BodyBilt Intensive – Use seating is built to withstand the rigors of 24-7 use applications while delivering outstanding ergonomics. This model is ideal for a wide variety of workplace settings where multiple employees are using the chairs around the clock, like 911 Call Centers, Security Guard Stations, Control Rooms and multi-shift assembly operations. The heavy-duty mechanism offers the seat slider feature as standard. Wide Seat PanBariatric Chairs Warranted to 500 lbs S2504 Starting at $1,327 – 40% off list! These big boys are built to last, with your comfort in mind. If you are tired of replacing broken chairs for your larger folks every few months, we have the solution. BobyBilt chairs are by nature built to the strongest specifications. Our Bariatric and Big and Tall series add even more strength with heavier duty components and a warranty to back them up! Many years ago farmers knew the advantages of a contoured seat. They sat in these “metal” contoured tractor seats for 10 & 12 hours a day. The secret is the shape. The BodyBilt contour shape conforms to your body. Simply put, more of the seat touches more of your body. Therefore, your weight is more evenly and thoroughly distributed over a larger area. 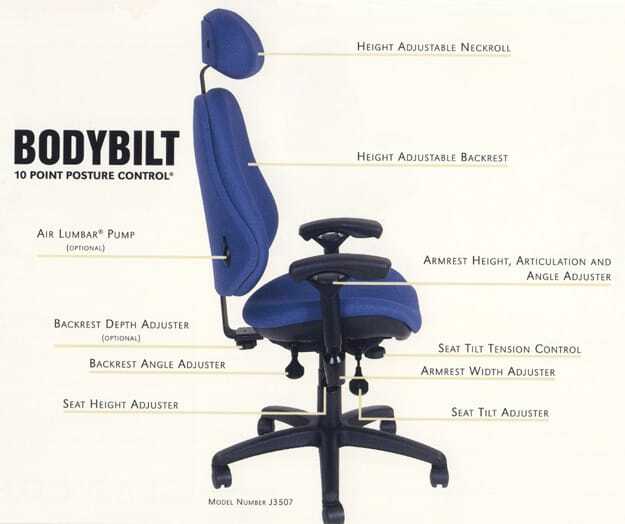 Bodybilt ergonomic chairs take advantage of this contoured shape. We offer a very prominent contoured seat pan #2 to a minimal contoured seat pan #8. The #7 is the most popular, accounting for 70 – 80 percent of sales. ..with the forward and backward parts compatibility of the BodyBilt chairs. BodyBilt calls it “Parts Modularity”. No other chair manufacturer has this. Meaning that, 10 years from now, when a part needs replacing, the same parts BodyBilt are using on that year model chair will bolt right up to you old chair. Most chair manufacturers want you to throw the chair out when a part breaks and buy a new chair. Hello. My name is Greg Bright. Back in the 90’s, when I came up with the idea for a laptop stand to be used with reclining office chairs at computer workstations and desks, most people thought ergonomics was some sort of disease. Little did I know then, as we say now, Comfort is Ergonomic™. It’s really pretty simple. If you are not comfortable in your office chair, your body is telling you that something is wrong…something is not ergonomic about your present situation. My journey through the development and marketing of my laptop stand has brought me to one main conclusion. Nothing can improve ergonomics for the computer workstation or office desk better than a proper ergonomic chair – Experts all agree. I realized early on, that the BodyBilt chair had something unique going for it. These chairs are built from MODULAR components, allowing interchangeability of the parts for a custom build, or retrofit for a new user, extending the life of the chair for business users when new employees come aboard or for replacement parts. My goal is to make you more productive at work (or home). What if I could help you feel like you have “only” put in an 8 hour day, when actually you have worked for 12? Most office chair manufacturers have their chairs made in China for the average size human. Are you average? Are you male, female? Do you find that you are constantly fighting to keep your chair in the proper position? Let us custom build one for you today. We can probably have it shipped out in less than 10 days! More ADJUSTABILITY – 25 Arm options * Widest Seat Pan Range – Wider Range of Motion – 100’s of colors and fabrics to choose from. 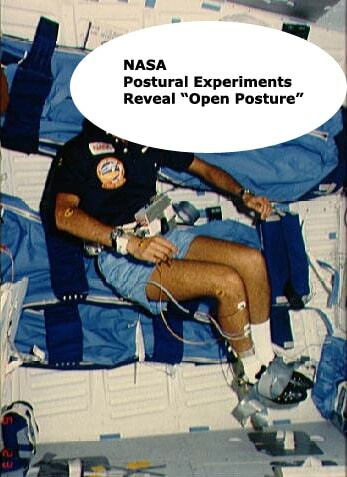 NASA Postural Experiments -“Zero Gravity – Sleep Studies” resulted in natural – Relaxed Body Alignment. In other words an “Open or Reclined Posture”. Announced at the annual meeting of the Radiological Society of North America. MRI imaging proves that an upright posture is Bad for your Back! We invented and Patented the Aviator Laptop Stand to allow Open Postures while using a laptop. High Back – Executive Chair – K3507 Starting at $1,229 – 40% off list! K3507 with Air Lumbar Pump Starting at $1,286 – 40% off list! 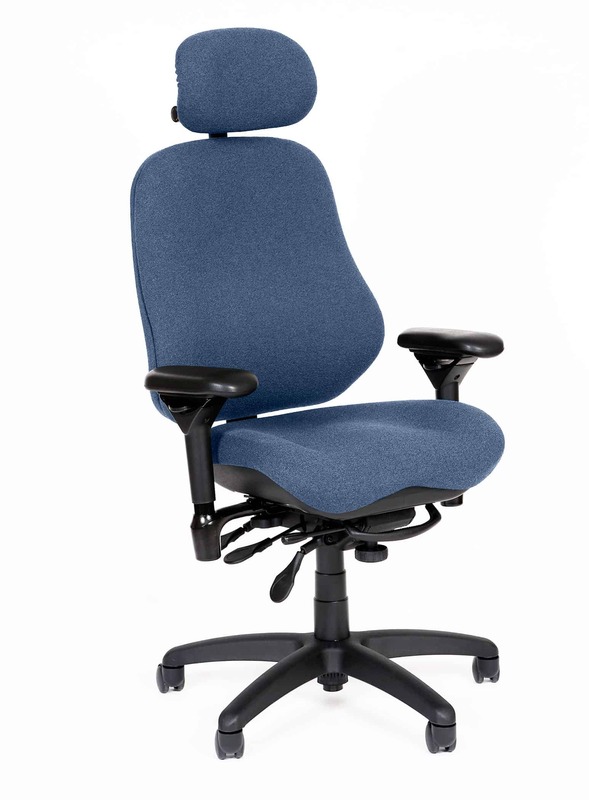 While we would like to see all users in a chair with a headrest, our executive series gives whole body support. Head support is imperative if you do any kind of reclining. A reclined seated position has been proven to be a healthy way to sit and of course we promote this with our patented laptop stand – it’s important to note that ergonomists recommend that you frequently change your seated position throughout the day. Therefore, one seated position is never recommend to stay in all day. Executive Office Chairs Double Stitch Loose J3507 Starting at $1,997 with real leather – 40% off List! – Yes they are expensive – but how many hours a day do you spend in your chair? Mid Back Task Seating – J757 Starting at $961 – 40% off list! High Back Managerial Office Chair -K2507 Starting at $1.085 – 40% off list! The chairs most people are buying today are designed to fail in just a few years, so they can sell you another chair. BodyBilt chairs are made for a Lifetime. No other chairs offer “Metal to Metal” connectors, using Heavy Duty – 1/4” steel seat pan support wing (Stabilizer Bar) – 11 gauge armrest support brackets and – 1/4″ steel plate Structural Support. Furthermore, All BodyBilt parts are Interchangeable – (we just replaced a chair armrest for a customer with a 14 year old BodyBilt. The newest 4Arm armrest bolted right on.) Talk about Lifelong Reparability. Try doing that with another chair, even during the same model year! The Military is the largest purchaser of the BodyBilt Chairs – they’re that tough! ESD – Clean Room Chairs – Class 100 1010-F1 40% off list! ESD – Clean Room Chairs Class One – ESD J231-PCR 40% off list! Medical Chairs J707-B6 40% off list! High Work Surface Clean Room – ESD Chair J707-F1-B3 40% off list! What Makes BodyBilt the BEST Option? The benefits and cost savings of BodyBilt seating may not be realized by solely comparing initial up-front costs, but by comparing the long-term COST OF OWNERSHIP over a 10-year period. BodyBilt’s unsurpassed comfort, modularity, ease of serviceability and continuous aesthetic appeal throughout the entire line of products were specifically designed to create a chair that is cost effective and functional for almost any work environment. Laboratory proven increases in comfort and productivity (NC and IRS Studies), thus increasing your Return on Investment for the chairs quicker. IRS Study(see below) shows 8% increase in productivity. Interchangeability of parts / Limited Warranty Better construction, lengthy warranty, parts interchangeability. Convenience: Lack of modularity eliminates ease of parts replacement. Broken Chairs Must be stored for return to factory. Increases “down” time. Any Part can be interchanged in minutes. Convenience of keeping small inventory of parts OnSite to make easy quick repairs / changes. Forward & Backward Compatibility. When one part of a chair becomes damaged, the entire chair most likely will have to be replaced. Modularity / Interchangeability of chair components, with BodyBilt’s longtime (sustainable) goal of keeping these components standard will greatly increase the lifetime usability of your chairs beyond the warrantee period. Changing chair parts to accommodate employees as they come and go will also extend the lifetime value. Because of BodyBilt’s Modularity, if one part of a chair becomes damaged, that specific part can be replaced, extending the life span of the chair. Aesthetics: Chairs that have different uses or sizes also have different styles, thus reducing the look of continuity throughout an office environment. At BodyBilt we have 6 different seat pans, 4 different backs to fit each person or task to their specific needs, while keeping a continuous aesthetic appeal throughout the office. ASSET MANAGEMENT: Other brand chairs have no way of tracking the placement, departmental costing or warranty issues relating to a specific chair. BodyBilt chairs come standard with their own Serial # allowing it to be tracked to a specific person and/or department, in addition to keeping a service record for the life of the chair. It also helps identify chairs that are “accidentally borrowed” by another person or department. SEAT: Chairs have parts that are screwed into wood or plastic. BodyBilt chairs are all metal to metal. Nowhere on our chair does the bolts screw into wood. Thus makes for a stronger hold. Plywood Seat Pan offering no contours. Vacuum formed ABS seat pan with anatomical contours and unique (Patented) recesses for “sitting bones” & “tail bone” to create BodyBilt’s seat-pressure reduction system. Single density foam. Increased seat foam thickness with multiple densities and pressure reducing “pockets”. Available memory-type foam to further enhance comfort. Flat seat pans offering no reduction in seated pressure on the main sitting bones. “ISH DISH” – Air pocket formed in certain seat pans to reduce the pressure on the ischial tuberosities, the main sitting bones (Hip Bones) and the coccyx (Tail Bone). This is unique to BodyBilt seating. No or limited options increase or decrease seat depth. 2 options available for increasing seat depth to properly fit each person’s femur length. Back Depth Adjustment & Seat Slider offers a 2.5″ & 2” depth adjustment range. One size seat to fit all body types and sizes. 6 different seat pans. Since no two people are built exactly alike, BodyBilt can fit the chair to the person, rather than expect the person to fit the “one size fit all” chair. Big & Tall model for persons up to 500 lbs. BACK: Most chairs come with backs that place the lumbar in a fixed position, with no or limited adjustments in height Standard VAM (Vertical Adjustment Mechanism) allows the lumbar to be positioned in one of 8 positions throughout a 4-1/2” range. No or limited option to increase or decrease the amount lumbar support. Optional Air Lumber provides individual customization of lower back support to relieve stretched ligaments, muscle fatigue, vertebrae misalignment and pinched discs. One Size Back Rest to fit all body types, sizes and back problems. 4 different back options with multiple options to fit the person, job type and (most importantly) help relieve back pain. ARMS: Usually have only one option for arms, with no adjustments or only height adjustment that doesn’t conform to each person’s individual requirements. Standard 4-Arm offers 4 different adjustments (height, width, 360 o pivot and forward/rear articulation) to fit the person’s needs for their specific task or body type. Additional arm options: Optional Veritask arms are available with 12 different arm pad styles that fit into one arm support mechanism, increasing the flexibility in meeting a person’s requirements while controlling costs. – All BodyBilt chairs models offer total metal to metal connections. ”I-Series” chairs are made for shift uses 24 hours per day, 7 days per week. They include additional steel structures in seat pan and mechanism to give maximum strength. Heavy duty Tilt Mechanisms. Most chairs are tested to a maximum weight capacity of 250 lbs. Weight capacity is for standard chairs are 300 lbs . “S-Series” chairs are warranted for up to 500 lbs. MEDICAL NEEDS: Meet specific medical needs. BodyBilt chairs are certified Medical Devices by the FDA. • The Internal Revenue Service conducted its own in-house study to track the increased productivity within 2 separate studies, in which only the chair was replaced. The operator in each case was a data entry operator on permanent staff, well-experienced in his/her job function. Production histories for each employee were available, measured in terms of documents per hour. While a portion of this improvement in production was possibly due to some increase in the production rate, each operator expressed the opinion that a good portion of the increase was due to the operator being more comfortable (in their seating posture), thereby being able to produce for longer periods without the need to move around, take a break, etc. In their conclusion, the IRS realized an average of 8% increase in productivity . This 8% increase in productivity with an employee earning $14,203 per year, with a chair cost of $550, shows an average monthly savings of $94.68 per employee. This average savings means the chair pays for itself in less than 6 months . • In 2004, the Ergonomics Center of North Carolina conducted an independent study measuring the Peak Pressures exerted on the main sitting bones (ischial tuberosities) and the thigh region. “This experiment demonstrated the superiority of the BodyBilt office chair seat pans over their competitors. The BodyBilt seat pans surpassed competitor seat pans in most categories of analysis, including peak pressure minimization and contact area maximization. It was equally effective with competitor seat pans in discomfort limitation”. “The seat pan contour and urethane foam combination of the BodyBilt seat pan is recommended over the Brand X and Brand Y seat pan because it significantly reduced peak pressure and increased contact area of the buttock and thigh. Additional research may be needed to further explore the effect of foam type and seat pan contour on pressure distribution and discomfort measures”. Questions and Answers, ErgoSolutions Magazine, ErgoBiz Perspectives Matt Prochaska, VP & Plant Director, ErgoGenesis, LLC., addresses the business case for ergonomic seating. ErgoSolutions Magazine: How have the benefits of ergonomic seating been measured through cost/benefit analyses? Matt Prochaska: There have been many studies done to determine the benefits of ergonomic seating. Without a doubt over recent years the use of ergonomics in the work-place has been questioned, probed, measured, and in many cases applied. In general, applied ergonomics can be demonstrated in many different aspects of the every day environment of the American worker, be that the boardroom to the mailroom, architect to air traffic controller. One of the ways ergonomics can be applied to the workspace is through that of the ergonomic chair. The quantitative benefits derived from the use of ergonomic seating have been studied, and measured. Then there are those less tangible qualitative benefits that can be acquired through an ergonomic environment, such as reduced turnover, improved morale, and improved quality of work life. Dr. T.J. Springer, president of Springer and Associates, demonstrated that the performance of State Farm Insurance clerical workers improved as much as 15% with ergonomically acceptable workstations and seating. In a study done at the University of Miami, Dr. Marvin Dainoff reported from his laboratory work that the keystroke rate for entry-tasks increased five percent when workers were moved from an ergonomically unacceptable environment to one that was ergonomically correct. The performance of office workers at Blue Cross-Blue Shield was shown to improve with the move to an ergonomically enhanced environment, resulting in an over-all productivity improvement of 4.4%. The Norwegian State Institute studied the incidence of back discomfort among office workers. After improvements to work station layout and seating, back related absenteeism was halved, turnover was reduced from 40% to 5%, and 40% of employees on disability leave returned to work. The Internal Revenue Service performed a study on productivity and found that those seated workers that sat in an ergonomically correct chair (which was a BodyBilt chair in the actual study) were on average 8% more productive than their counterparts that did not. The importance of this data is underscored when it is recognized that muscular sore-ness is the second-greatest cause of absenteeism, after the common cold. The direct economic impact of improving human productivity in the office is tremendous. Ergonomic office furniture, and environments are not a panacea. What ergonomics can do is provide the foundation for effective management, and trained people to per-form at their best level. The percentage of human costs to all other costs pushes the business community toward investing in ergonomic environments. Based on these findings, I believe that proper ergonomic seating is actually an invest-met for a company as opposed to an expense. Employers and Managers should take this information seriously, as it represents an impressive way to improve a company?s bo t-tom line. Truly, purchasing ergonomic seating is a “win-win” proposition as it increases a company?s profitability while making the employee feel appreciated and recognized while lowering the potential for missed work and repetitive stress injuries which will benefit the company and the employee?s quality of life. That?s why I believe that providing proper ergonomic seating makes good business sense. ErgoSolutions Magazine: What are some of the “less tangible” benefits realized through the use of ergonomic seating? Matt Prochaska: Certainly the most tangible benefits of ergonomic seating are less injuries and increased productivity resulting in happier and healthier employees and better profitability for a “for-profit” company or better realization of goals for the “non-profit” organization. Less tangible benefits include better working conditions for employees, increased morale via the recognition and appreciation shown to the employee when the employer recognizes their need for proper equipment. Valuing employees and their work can be shown in many ways. Managers and employers can truly show how they value an employee by providing the very best in seating, as the office chair is the most integral part of the employee?s comfort during the work day. Also significant yet unrealized by many is the decrease in health-related costs associated with a complete ergonomic program, with the foundation of that program being an ergonomic chair. During this time of “empowerment” in the workplace, employers can realize goals and objectives by paying themselves back through the investment of a good ergonomic chair. ROI (Return on Investment) ratios can be significant through these tangible and even less tangible benefits. ErgoSolutions Magazine: How can businesses begin their own cost/benefit analysis of ergonomic seating and applications? Matt Prochaska: A company interested in really measuring the value and ergonomic status of its work environment can begin by collecting baseline data from a select group of employees. Using their present work environment, measure criteria such as the number of complaints of soreness associated with work tasks, number of sick days, frequency and length of rest periods, morale and volume of work completed. This data should be collected for a pre-determined length of time. Next, introduce the ergonomic equipment, such as seating, desks, and keyboards into the work environment. Personal instruction should be given to each employee on how to use, and adjust the equipment. Permit a definite length of time to ran-spire to allow the employees in the study group to acclimate to the new environ-met. Then these same individuals can be observed, and data collected in contrast to the baseline assessment. Introduce several different models into the environment for hands-on testing. After the initial work environment assessment, introduce your ergonomic feature and/or features into the workplace including those manufactured by several different suppliers. Rotate the ergonomic products within the work-study group, allowing each employee to test or try each different model. Then poll the employees on which models they prefer. It’s a good idea to preset criteria for the employees which can be used to “grade” the different manufacturer models. And keep in mind there are many extremely qualified professional ergonomic consultants out there to help design an ergonomics plan for your company. Today, the decision isn’t whether or not ergonomics is needed, but which ergonomic product and/or products are the best cost vs. ROI for the employer. I am sending you a second request for more information on your 24/7 chairs. Our department is looking to purchase some new chairs and we are interested in yours and we would also like to try them before we purchase them. Thank you for your time. We are searching for 24/7 control room chairs that do what they should, support comfortably and last. Please send details and pricing. I attempted to link to more info from the image “BodyBilt 24-7 Control Room Chair”, with no success. Please send me a quote for 10 of the 24-7 Intensive Use Chairs i757. I am located in janesville, WI 53548. Our 911 center is looking into purchasing up to 3 24/7 Bodybilt chairs. If you could submit a quote to the email address for 2 and 3 chairs with shipping costs to Gahanna, Ohio. My name is LeSean Campbell and I work with the Melbourne Police Department 911 Communications Center. We are currently looking into 24/7 intensive use seating by Bodybilt chairs. Could you please send me your brochures and your pricing and shipping information on these chairs by Feb.6th? Also, please advise if you have a demo program for your chairs. If you have any further questions please feel free to email me. We are looking to purchase approximately 6 chairs. We have a 24/7 operation and we have a couple of heavy people. Can you send me some info on the most popular chair? It will probably be 3 and 3 because some like the mid back as others like the high back. Thank you for inquiring about our BodyBilt 24/7 line of special needs chairs. Bodybilt chairs are custom made to order with many options to fit various end user height and weight ranges. We usually sell a fairly standard model 24/7 use. It’s the Intensive Use “Core” line, with a high double rub tested upholstery wipeable fabric and comes with a headrest for users weighing up to 300 pounds. That chair is in the $1450 price range plus shipping. The Crew and Captain series add more expensive upholstery, with the Captain being leather and it’s very expensive. The Core series comes with Staccato fabric and is the most durable of the all, and the least expensive. Typically, control rooms and call centers need some combination of regular and the “Big and Tall” series – warranted up to 500 pounds. The Big and Tall series comes with a more substantial base mechanism and wider seat pan and adds about $175 to the chair. Seat depth is easily changed between shifts with the seat slider bar, located at the front of the seat pan. For special needs, an array of optional features is offered to address almost every seated task from the office to industrial settings. These BodyBilt chairs are not only proven to be the most comfortable on the market – they are built to military standards – as the military is one of the largest purchasers of these chairs. The best part of the BodyBilt line is that all parts are forward and backward compatible – allowing you to replace parts as needed down the road – most chair manufactures design obsolescence into the chairs so you have to buy a new one every couple of years. We have sold to 911 call centers and control rooms for over 8 years with “zero” issues – customers only call us to tell us how comfortable and durable they are after years of use. Please note: Oftentimes chairs fall under your facilities group purchasing guidelines, where they have pre-approved vendors. This probably means that our company is not on that list of “pre-approved vendors”. When this happens it sometimes falls under “Special Needs” purchasing and they will allow you to purchase from us (or direct from our factory ErgoGenesis). Please double check with your facilities group regarding this. I can email you some brochures if you need further information. I am Looking for the above chair, can you please share the quote for the same and shipping would be to Mississauga, ON, Canada (Postal Code – L5R 3G5). Hello Aditya. I’m sorry, but we can’t get the chairs shipped to Canada.